Apple on Tuesday held its annual shareholder meeting, where the company's board was re-elected, Ernst and Young was named its accounting firm, and a number of shareholder proposals were rejected. AppleInsider was there and offers notes of interest from the proceedings. When asked about the Mac Pro and professional-grade software versus a focus on iPhones, Apple Chief Executive Tim Cook noted that a third to 40 percent of the company's revenues are not from the iPhone. "You will see us do more" with Macs and professional software, he told shareholders, noting that creative and pro markets are very important to the company. 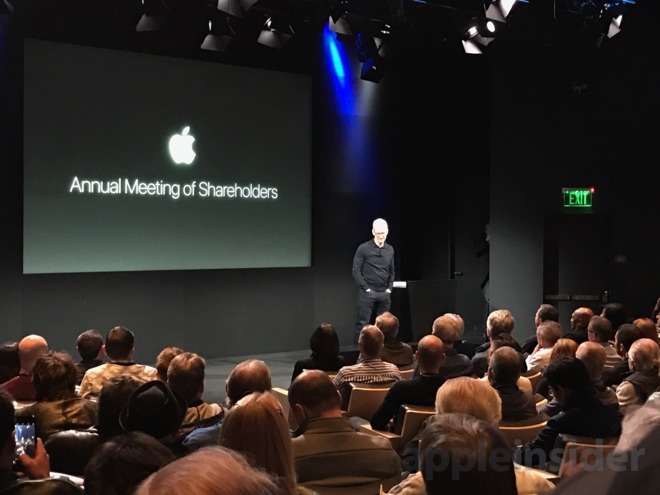 Cook noted that this year's shareholder meeting will be the last held at the current headquarters at 1 Infinite Loop. By next year, the company will have relocated to Apple Park, and the shareholder meeting in 2018 will be held at the Steve Jobs Theater. Among the shareholder resolutions proposed this year, most failed with less than 5 percent of the vote. However, two of them gained some traction: There was 31.9 percent support for proxy access to suggest board nominees, and 24.23 percent voted for executives to retain significant stock. One comment on the latter proposal noted how Apple executives frequently sell all their stock when it vests. Cook also provided shareholders with a "state of the company" overview that was largely in line with previous comments from the CEO. He noted this is the first year Apple had three iPhones the SE, 7 and 7 Plus, and that the 7 Plus went "far beyond" predicted sales. Cook also noted that the iPad Pro was "nicely received." It's expected that Apple will update its touchscreen tablets in the coming weeks. The CEO repeated his company "couldn't make enough" of Apple Watch Series 2, and that last quarter was the best one yet for the wearable device. He also spoke of AirPods is being a "cultural phenomenon," and played the AirPods television ad. He noted that Apple Pay "hit an air pocket" this year and that adoption in us trails other countries where NFC is more broadly available, specifically noting China and Australia. Cook repeated that Apple Music hit 20 million subscribers in its first year, and noted that through the App Store (including services like Netflix) Apple now has 150 million subscribers interacting with the company. He also noted that Apple has 491 retail stores in 18 countries. Cook also repeated plans to increase dividends annually. He stated that 93 percent of Apple's energy needs are now renewable, and has reached 98 percent compliance in supplier accountability standards. The board took a comment from the Rev. Jesse Jackson, who expressed appreciation of Apple's leadership "through a difficult season", specifically noting Apple stance on encryption, workers on HB1 visas targeted by Trump administration, transgender rights and women and minorities. Somebody asked about the safety of AirPods related to radiation. Cook said obviously the company would not sell a product that they thought was dangerous. Cook also touted job creation in the U.S., and said that the company has created 2 million jobs in America —1.4 million of them related to app development. He also spotlighted $50 billion in payments to U.S. suppliers, including Corning Glass and 3M adhesives. When asked about taking a political position on net neutrality, Cook said the Trump administration does not yet have a clear position and "is still forming an FCC." He also said "we don't like politics" and "we're not the lobbying company," but also stated that Apple wants to be involved in policy formation, citing encryption and other issues.